Don’t worry, I didn’t forget this time. I just wanted to wait a day before I gave my thoughts, since this is not a comic or movie, it’s a video game. 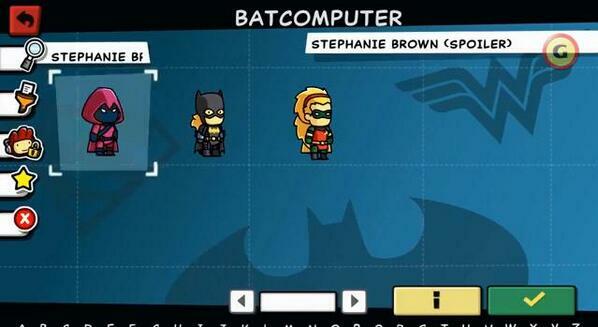 Let’s take a look at Scribblenauts Unmasked: A DC Comics Adventure for the Nintendo 3DS! So the game begins with two siblings, Maxwell and Lily, who are the main protagonists of the game. They’re currently engaged in a dispute comic book fans always seem to have at one point or another: Who is the better superhero, Superman or Batman? Well, they decide to find out, as both have very unique powers that can find the answer: Maxwell has a sketchbook that can make whatever he sketches real, and Lily has a globe that lets her and whoever she wants travel wherever she wants. So, Maxwell tears a page from his sketchbook, writes ‘Gotham City‘ on it, and slaps it onto the globe, thus making the DC Universe real. However, in his excitement, Maxwell made a terrible mistake, as it seems the page he tore had something on the back: Doppelgänger, his evil twin, who aligns himself with the villains of the Justice League and goes on a rampage in Gotham, Metropolis, Oa, Atlantis, and more. Thus, the goal is to try to undo the chaos that Doppelgänger and the Injustice League creates. The game works as many Scribblenauts games do: You control Maxwell and use his powers to solve different puzzles and scenarios, only this time, they’re spread across several iconic locations in the DC Universe. There are a lot of ways to go about solving these, by creating items, summoning heroes, adjusting pre-existing objects and people, and more. Sometimes you’ll have to do something very specific, while others can have multiple options with varying levels of reward. Many puzzles are non-mandatory, for the most part, but the only way to move on to new levels is to complete these puzzles and earn reward points. Fortunately, the non-mandatory ones are randomized, so if you don’t like the ones presented, you can just leave the level and come back. Also, Superman villain Mister Mxyzptlk will occasionally present optional challenges when you enter a level that will limit what you can and can’t do while there for that trip, but if you take him up on his challenges and succeed at solving the scenarios, they’ll grant you additional reward. So, given that this is a crossover game with DC heroes, who all shows up? Just about EVERYBODY. Not only are there the major A List superheroes, like Wonder Woman, Batman, Superman, and Green Lantern, with multiple variations for many (although usually defaulted to their New 52 versions), but there are so many others in the game as well, and each with summaries of who these characters are for anyone who isn’t familiar with them. And yes, the roster includes Stephanie Brown as Spoiler, Robin and Batgirl. Yes, it includes Wally West, Donna Troy, Helena Bertinelli, Cassandra Cain, Renée Montoya, both Aqualads, and so many more. Everyone should have at least one favourite hero in this game. Heck, even Linkara’s favourite superhero of all time, Danny Chase, is in here. And that’s just the heroes! You can summon villains too (although why you would ever want or need to, I have yet to discover), and yes, there are a crap ton of them too, with their own bios! This isn’t just a game, it’s a freaking encyclopaedia! I think there was only one or two moments where I searched a character and couldn’t find them, and even then, the number that are in with their own unique assets kinda makes me forgive that pretty easily. Now, I do have one complaint about the game, and it centres around the version I got. This game is also available for the PC and Wii U, and one of the features of the game that was promoted pretty heavily was the Hero Creator, where you can create your own heroes by mixing and matching parts of other heroes, colouring them to your liking, giving them their own unique powers, etc. And as you’ve probably guessed by now…yeah, it’s not in the 3DS version. That was a MAJOR let-down for me, as I was planning to create versions of my own superheroes, The Hexagon, in the game. I do understand what is the likely reason it wasn’t put in the 3DS version, though: Putting in as many characters and variations of characters with their own unique powers that can be used for battles or puzzle solving, on top of a lot of the different stuff already in a standard Scribblenauts game, and even making copies of their weapons, gadgets, and costumes that Maxwell can create for himself, was pushing on the game’s memory too much. Plus, you can make adjustments to heroes by summoning them and adding adjectives to them, like Fast, Flying, a different colour, stuff like that. And, the 3DS DOES have something unique to it, in that it has Streetpass support, here you can unlock hero costumes for your Mii. HOWEVER, all of that said, if it wasn’t going to be in the 3DS version, they should have made that explicitly clear from the beginning. And I checked, I checked the crap outta news sites, and other than speculation, there was NOTHING solid either way. Overall, though, while I feel disappointed in missing out on the Hero Creator, I am still enjoying the heck out of this game. 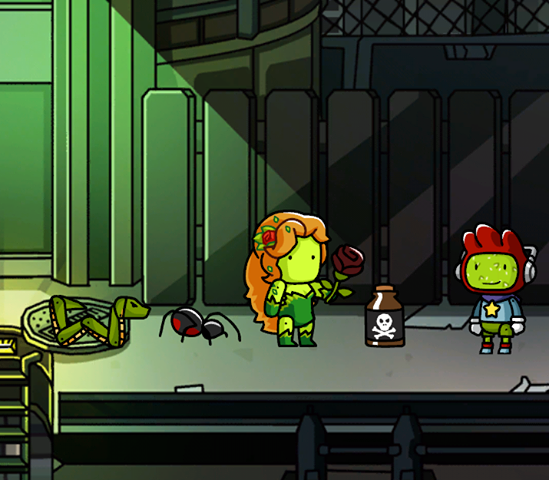 If you’re a fan of the Scribblenauts series, I think you’ll really like this installment. Also, if you’re like me and are a comic book fan that was curious about getting into Scribblenauts, I think this is the way to go. But hey, feel free to let me know what you think of the game in the comments section below. Anyway, next week is October, which means my regularly scheduled comics can start coming out again! So, be sure to check in as we venture to Earth 2 to see how the future JSA is getting along, and we check in on The Movement. Ja né!